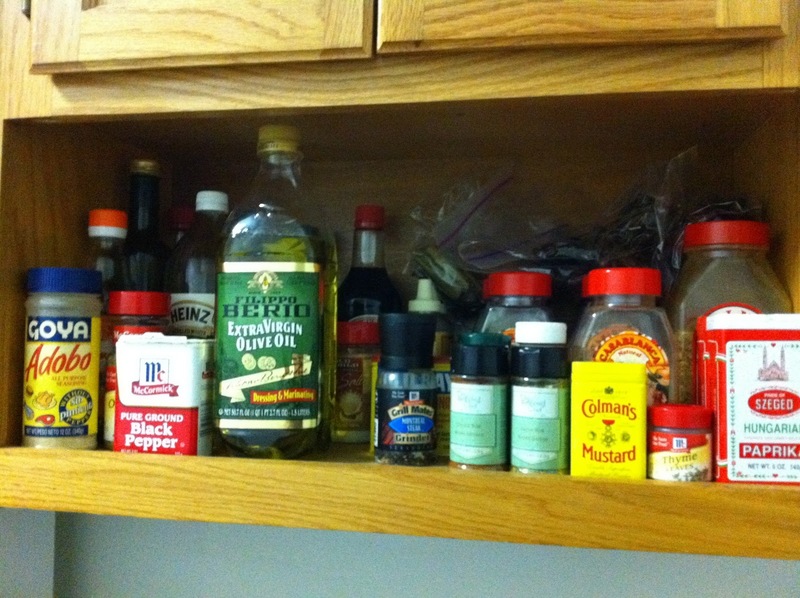 This week I have two somewhat ad hoc recipes for you. Last night I was tired after a long weekend doing nothing. Seriously. It was the first weekend in a long time upon which I had no plans. First was an ice cream social party with the fine folks of Reddit Astoria. Saturday I had the Thrifty Sifter, my friend GM, and a friend of his over for lamb burgers. Sorry folks, but I didn't photograph this meal. The reviews were great, though. Sunday was spent lazily with Ms. Thrifty Sifter in the park. The bad Sifter hasn't updated in a while, but I'm probably distracting her with fun swinging in hammocks in the park. 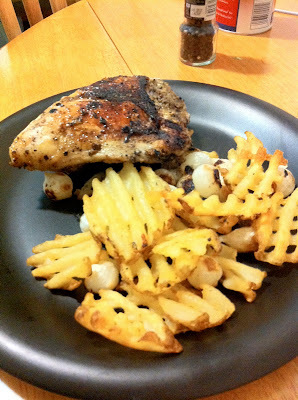 She left for her abode and it was time for me to make dinner. I still had pearl onions (frozen) from The Chicken Pot Pie and I still had waffle fries left over from the lamb burgers. 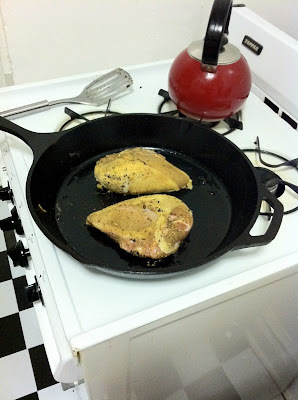 Of course I wanted to use my trusty iron skillet, so I settled on some inexpensive, bone-in chicken breasts at the grocery. That's the fine folks at Key Food. When you get a chance, take a look at their Recipe of the Day page. You know what else I have laying around? The Black Prince peppers from my dried chilies entry. 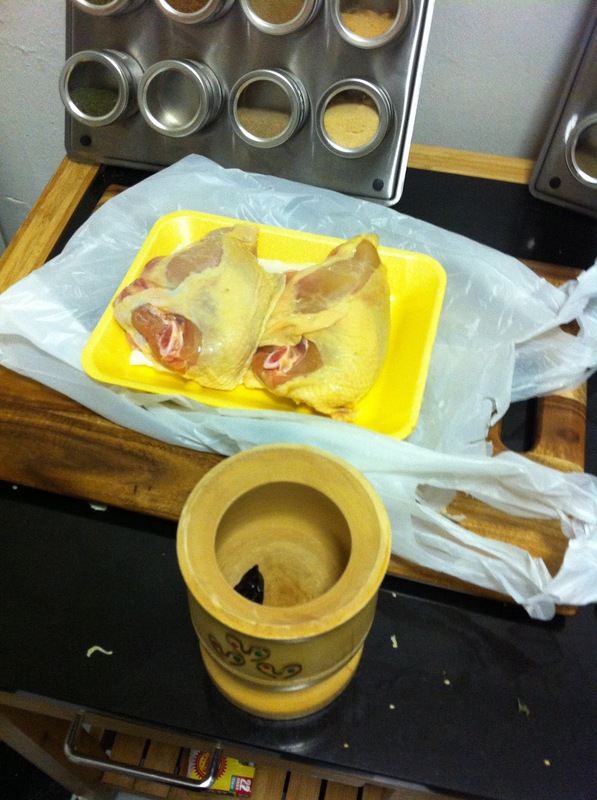 Enter my cheapo mortar and pestle from Key Food rival C-Town. They also have a recipe page, but I digress. To prepare, add two dried chilies to the mortar. 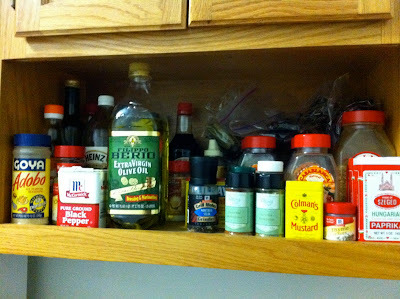 You'll also want (from left to right on my recipe shelf) standard adobo (about a tablespoon), Coleman's dry mustard (about a teaspoon), and cumin (about a tablespoon). Meanwhile, pre-heat your oven to 450. 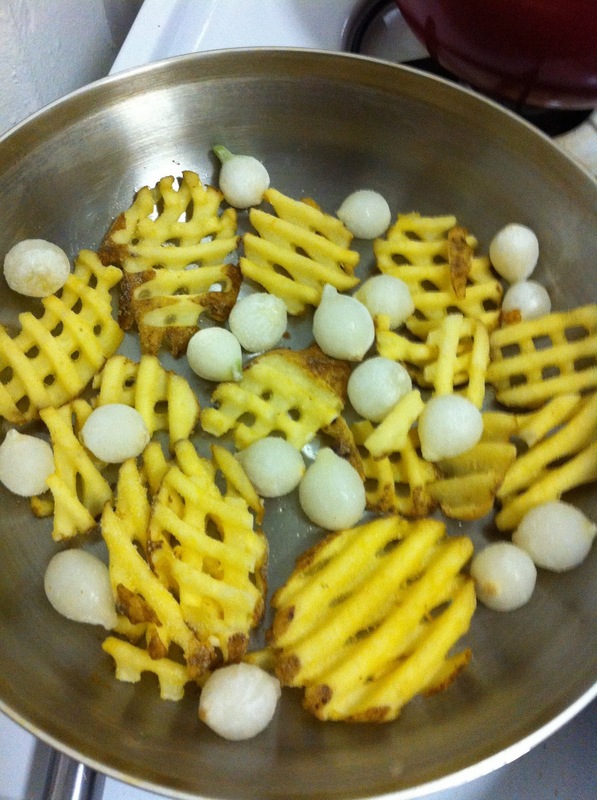 I didn't use a baking sheet, just placed the waffle fries and a dozen and a half pearl onions (still frozen) in a stainless steel pan. I'll admit it: this was totally lazy and didn't work out all that well. The onions are great roasted and the waffle fries are, of course, just fine out of the over, but...they really didn't work all that well together. Next time stuff a baked potato with roasted pearl onions. I bet that will do the trick. I did not separate the skin from the chicken here like I normally do for roasting chicken. 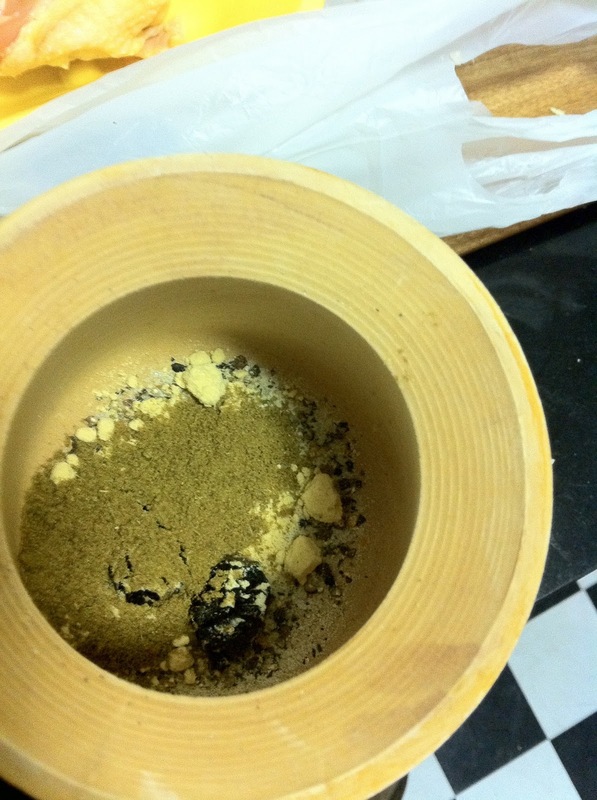 The mixture was simply rubbed over every available surface. Heat up about three tablespoons of oil in the skillet and then place the chicken in. 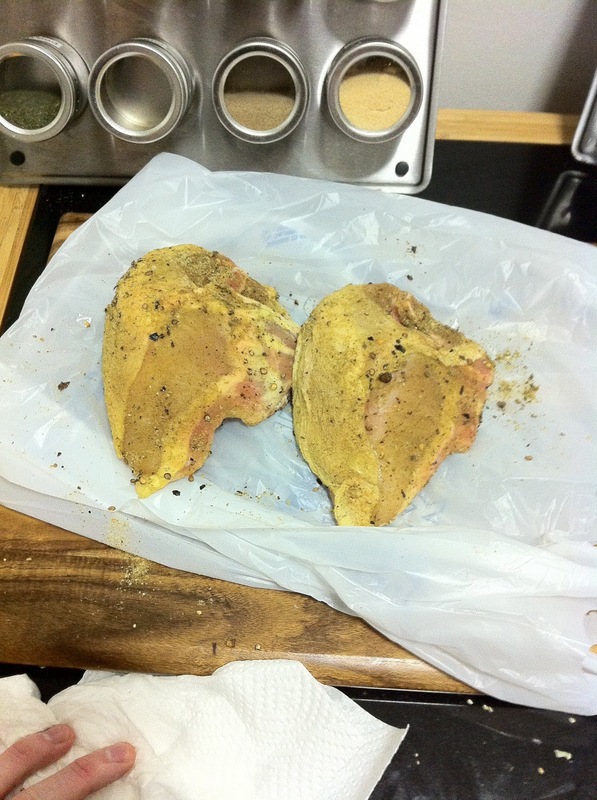 I did about 20 minutes per side as these were fat breasts. To distract you from what I just said, make sure to watch this episode on cooking oils from Alton Brown's "Good Eats." Even after a weekend of carousing I was famished. So before the main course I made a simple salad with leftover toppings from the lamb burger enterprise. 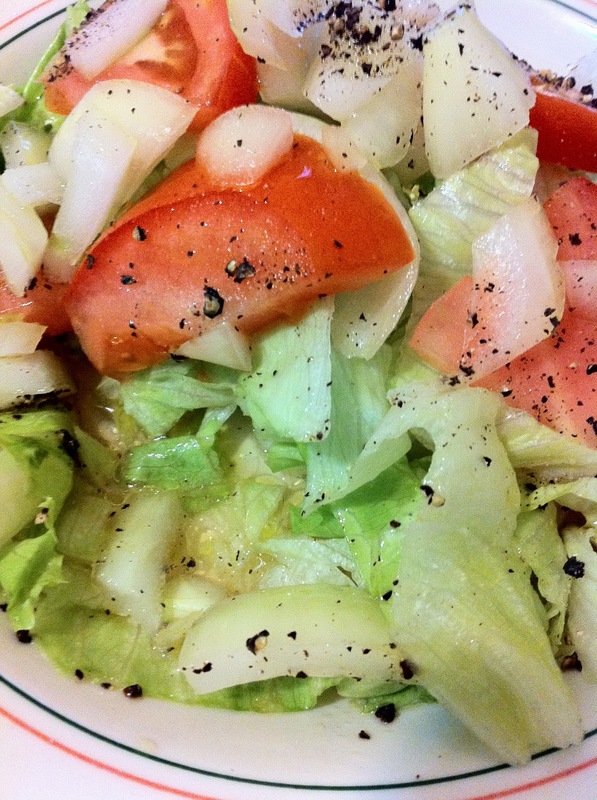 Part of a beefsteak tomato, half a small onion, and some iceberg lettuce. Topped with olive oil, salt, fresh ground pepper, and cider vinegar, I was pleased. And here's the finished product. I'm going to have to try a Black Prince pepper fresh at some point as what I made here made it difficult to distinguish its flavour. The heat wasn't overpowering and I feel the spices mixed well. However, this isn't one of my best impromptu recipes (though it did lead to tomorrow's entry which was). They were definitely something I wanted to eat twice as much of!